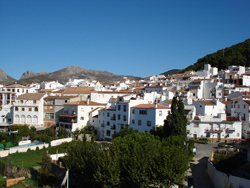 Alcaucin is a pretty white Andalucian village located in the Sierra Tejeda mountain range between Malaga & Granada some 500 metres above sea level. The origins of the village have been traced back as far as prehistoric times and the area is believed to have one of the earliest recorded instances of human habitation in the whole of the Malaga province. Today however it is the Moorish influences that remain most evident in Alcaucin from the time when the village and the province was under 800 years of Arabic rule until the Spanish Catholic conquest in 1485. After this time the last major changes to the village social structure occurred after the large earthquake in December 1884 that destroyed many of the Axarquia village communities. 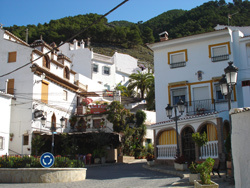 Today the village is a popular place to visit with travelers and walkers wanting to explore the rural Axarquia region of Andalucia. From Alcaucin visitors are able to enjoy the surrounding nearby natural park areas that provide great hiking and camping trails that pass through the Sierra Tejeda landscape. The most popular hiking route leads North from the village towards the 'El Alcazar' the site of an Arabic ruin from which the name comes and then onwards to the camping area 'Cortijo del Alcazar' 4 kms away. From here it is possible to continue on up through the 'Senos de la Tejeda' deep into the Andalucian countryside and then on to the rugged terrain of the Maroma Mountains, who's summit 'La Maroma' at 2065 metres is the highest point in the Axarquia region. Those who decide to make this excursion will be rewarded by some of the most richest zones of flora and fauna that this region has to offer, as well as some spectacular panoramas. The changing terrains on this route will allow you to see a number of types of vegetation typical to the region. Trees including Black Poplars, Cedars, Holm Oaks, Cypresses, and a declining number of Yew. Also shrubs such as pistachio, gorse, white cistus, wild vines, rockrose, ivy, juniper and hawthorn as well as wild herbs such as tyme, and rosemary whose heady aromas add to sensory experience. Once in the mountains the amount of fauna to see increases including mammals such as wild goats, badgers, and the elusive 'Linx' wild cat. It is also possible to spot many birds like linnets, blackbirds, warblers, redstarts nightingales and larks. Alcaucin has a couple places of interest within the village itself. 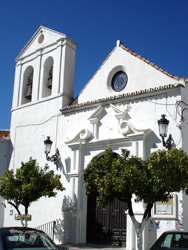 The Church of Nuestra Señora del Rosario on plaza Constitution built in the 17th century with a Roccco style nave, and the chapel of Jesus del Calvario on Calle Calvario also built in the 17th century. The Old Military Headquarters on Calle Arcos plus the town hall on Constitution square are also worth viewing. Also within the local area on the road that leads towards Granada are the remains of the fortress 'Castillo de Zalia'. Originally built by the Phoenicians and later restored by the Arabs the fortress was then converted into a prison by the Catholic Monarchs after the Alpujarras War in 1572. During the year Alcaucin celebrates many local fiestas and feast days including 'Carnival' in February, 'Semana Santa' (Holy week) over Easter and 'The Three Kings Parade' on 5th January. Other notable dates in the Alcaucin calendar are 'Festival of San José' in March, 'San Isidro Pilgrimage' to 'El Alcazar' 15th May, '5 Day Alcaucin Fiesta' first weekend of August, 'Candelaria' 7th & 8th September, '3 Day Feria Chica' 7th October, 'Fiesta de la Castaña' (celebration of the chestnut!) first weekend in November. For more information on fiestas in the region please see our Fiesta page. 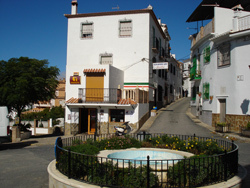 The village of Alcaucin has a small selection of bars and restaurants including El Rancho and Meson El Ciervo on Plaza Salia, a popular place to stop for a drink in the centre of the village. For more information on food & drink in the region please see our food & drink page. Shopping in the village is limited to a couple of local shops and a mini-supermarket where you are able to get all those 'essential' items. For larger supermarkets these can be found either in the town of Velez Malaga or at the 'El Ingenio' shopping mall both 20 minutes drive away. Alcaucin is located some 25kms inland from the coast with its many beaches. The nearest is beach resort is the coastal town of Torre del Mar with its wide sandy beach and good selection of shops and restaurants.